It’s Ultron week, so I’ve been focusing pretty heavily on getting you ready for the premiere with tips on throwing an awesome watch party and some everyday cosplay suggestions. Of course I couldn’t let this week go by without doing some Avengers-inspired fandom nails, right? I got my inspiration from other nail designs I found online. However, most designs I found were super colorful. I decided that I didn’t want to have so many contrasting colors happening on my nails, so I opted for blue on my ring fingers, and then I alternated between the slate and the black on my other nails. I work in an office, y’all. 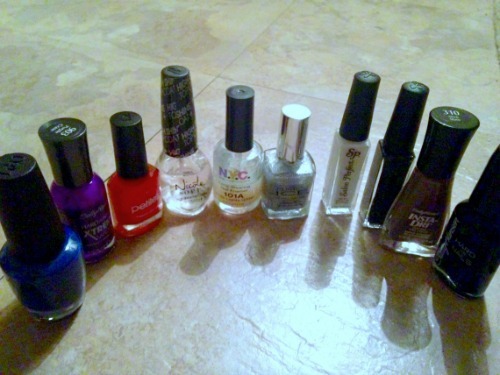 I can’t go around work with bright red, green, purple, AND blue nails, yafeelme? After picking base colors that would both serve my purposes and keep my bosses happy, I tackled the designs. For Thor, I opted for a lightning bolt rather than the mjolnir–way easier. I went for red (okay, dark orange–it was all I had), white, and blue stripes for Cap (I’ve seen several Captain America nails with stars, too, but I am so bad at drawing stars on paper, so I didn’t want to even attempt them on my nails). I created a arc reactor-esque design for Iron Man, and I drew a basic arrow for Hawkeye. Since I was quickly running out of fingers, I tossed symmetry to the wind and used my thumbs to rep Black Widow and Hulk. On one thumb, I drew purple and green (okay, teal–again, all I had) stripes for Hulk–I wasn’t even going to attempt to draw a DNA strand, radioactive symbol, or Hulk-face on my nails–and a red hourglass for Black Widow. What do you think? 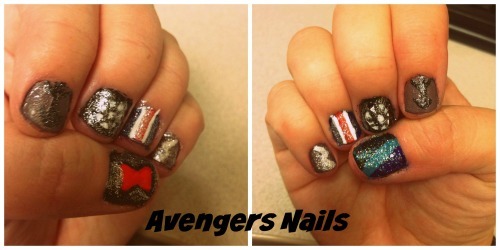 Have you tried any Avengers nail designs? Are you doing anything special for the premiere of Avengers: Age of Ultron? Let me know your premiere plans–be they watch parties, everyday cosplay, fandom nails, or something completely different–in the comments!